It is always exhilarating to discover an artist whose output is such a visceral rush that viewing their work is like going from 0 to 60 in two seconds. This is just the rush I felt recently when, in my favorite comic shop, I opened Mesmo Delivery to a random page as for me, my mind was already made up: this one’s coming with me and moving straight to the top of my (perpetual and ever daunting) “to read” pile. Mesmo Delivery by Rafael Grampá tells the deceptively simple story of Rufo, an ex-boxer and truck driver, hired to deliver an unspecified and highly secret shipment to an unnamed destination point. Along with him is an associate named Sangrecco, an aging Elvis impersonator who claims to not only know karate, but to have “five other styles” amongst his abilities. What should be a quick stop at a filling station/bar turns into a fist-fight between Rufo and a local goon, followed shortly by a complete and utter bloodbath as we see that Sangrecco was not bluffing when speaking about his martial arts abilities. 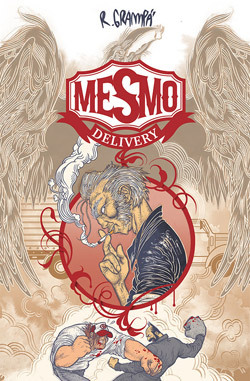 Mesmo Delivery is the creation of Rafael Grampá who was a contributor to the 2007 Eisner Award winning collection 5.Vertigo fans have seen his work through his astounding contribution to the 250th issue of Hellblazer. Grampá comes from a background that includes concept work and graphic design, experience that comes through page after page in Mesmo Delivery via the incredible layouts and attention to visual details. An extremely strong graphic sensibility is repeatedly seen in minor, yet very important visual cues & clues such as the logos on Rufo’s hat and the delivery truck. Though Grampá is relatively new to the comics world (Mesmo Delivery was first published in 2008 by AdHouse with the new edition just released by Dark Horse) there is no shortage of people comparing his style to those of established greats like Frank Quitely, Paul Pope, Jamie Hewlett, Martin Edmond, Katsuhiro Otomo and, most commonly, Geoff Darrow. Though such comparisons are made in a complimentary manner (no one can deny how sensational Grampá’s pages are) likening his work to others is calling upon, at most, surface similarities. For example, Darrow comes to mind because he and Grampá both employ obsessive detail in their work. The similarity really ends there though as Darrow, whose settings can be highly fantastical, still renders his characters in an extremely realistic fashion. Grampá, on the other hand, injects an exaggerated, almost cartoony style to his characters such as with Rufo whose massive chin sports swirling facial hair that looks more like little swirling black holes of stubble than anything you’d see on a realistically drawn person. Such ponderings aside, the true achievement found in the pages of Mesmo Delivery is the pure, crystal clear, undiluted, adrenaline rush of a visual experience that this deceptively slim book is. Dynamic doesn’t even begin to describe the energy that radiates off of the panels in this book. The slaughter in the latter half of the book, in which Sangrecco displays just how adept he is at the art of killing, nearly defies description. Here Grampá’s graphic sensibilities go into overdrive as song lyrics twist and swirl through the air and actions that would take but seconds in real time are stretched out across entire pages in which even panels themselves are sometimes abolished. As if the 51-page tale found in Mesmo Delivery weren’t enough, Dark Horse’s edition includes pin-ups by Mike Allred, Eduardo Russo, Craig Thompson, and Fabio Moon. These are followed by a “Making Of” section that includes numerous character sketches and panel breakdowns that give us a look into Grampá’s feverish creative process. If you missed out on AdHouse’s quickly sold out printing of Mesmo Delivery (or, hell, even if you didn’t) be sure to pick up a copy of Dark Horse’s new edition. This is a spectacular feast for the eyes of any sequential art fan and a sterling example of a major new talent. Highest possible recommendation.